Finding your way around town is about to change forever. 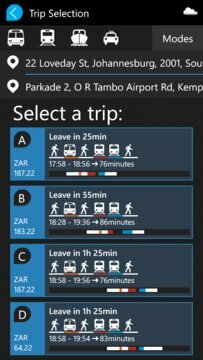 Public transport times, routes and live information will soon be at your fingertips through your mobile phone! 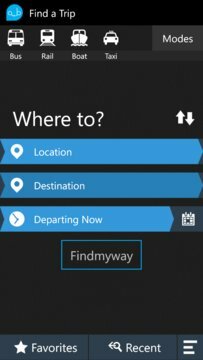 At the touch of a button, you can now find your way, with FindMyWay. The FindMyWay initiative brings together all modes of transport within a city, so that commuters can more easily access the information in one place. Future releases will include cross-modal journey planning, hailing a cab service, finding the safest cycle routes from A to B, and exploring the city and places around you. To start off we are supporting a wide variety of transport operators ranging from Robben Island Tour boats to Metrorail trains, Gautrain, Rea Vaya, MyCiti buses, the Durban People Mover, Golden Arrow Bus Services and many more. The city is now your playground, get exploring, and find the many treasures hidden amongst her streets. Never before has something like this existed for any African city, and we are proud to be making this dream a reality!